There’s been something of a recent pattern in my charity shop visits – an interesting, retro-looking fabric glimpsed, a hand reached out to disentangle the item from the surrounding coat-hangers, and then the moment of disappointment. It’s the moment of realizing that this is no hidden vintage gem, but an irritatingly good high street reproduction. The pattern or shape may resemble anything from a 60s baby-doll dress to a fifties fitted skirt, yet hold it up to light and the differences in fabric and construction quality become visible. Maybe this is snobby of me. In fact, I know it probably is. I am a clothes snob (although only in relation to what I choose to wear myself, rather than in judging others). If I’m going for vintage, I don’t want pale imitations, but the real deal – proper seams, darts and all. Good fabrics. Possible backstories and previous lives. That’s not to say I’m overly selective with the labels sewn into the necks of the clothes I buy in charity shops. I can and do purchase plenty of second hand high street garments – although they don’t exactly dominate my wardrobe. Yet the high street’s rather creeping embrace of vintage designs is something I find as fascinating as it is frustrating. It's been inevitable. Whatever appears on the catwalk eventually filters down to chain stores. The last few years have been a hotbed of references to each previous decade. About once every year and a half the sixties is trumpeted as “being back”, the nineties has been doing its damn best to infiltrate all areas of life with crop tops, mini-backpacks and pastel colours a-plenty, while the seventies seem to have returned in full suede-y, denim-y force. It’s natural to raid the past for inspiration. I have no problem with referencing 30s high glamour or 70s louche layers – the 20th Century (in particular) is awash with all sorts of silhouettes, colour palettes and textiles ripe to use for inspiration. It would be incredibly sad if no-one plundered the archives or used pictures from the past to influence their designs – especially because at various points, it seems, designers actually knew how to cut clothes for a range of different figures and body types. Lots of modern day brands could learn from that. Plus, looking backwards is something creatives (across a range of industries) have always done, and will always do. So I still can’t quite put my finger on why the high street’s facsimiles of vintage designs occasionally rankle. I think it’s maybe because the end result is that ‘vintage style’ becomes just another trend – another search term on eBay, another possible look among the pick’n’mix selection of other keywords like grunge, hipster, normcore, boyfriend, girly or festival-chic (am sure you can easily think of other even more nauseating terms). It often seems to be a market response to the resurgence of vintage, rather than genuine celebration of a particular decade – which in turn means you have to be extra-careful when perusing the labels in vintage shops, for occasionally the odd thing from Topshop slips through. There are other strands to this, many linking back to my self-acknowledged snobbery. Do I react more strongly if the label is high street rather than high end? Does my response change if I genuinely like the garment - especially if it seems like an inventive update of or homage to something classic? Am I merely perpetuating an attitude of exclusivism or style elitism? Am I being a hypocrite, as I definitely own a number of high street twists on vintage designs? Am I basically a tad irritated by something that doesn’t really matter at all? Probably 'yes' to every question. I do wonder though if it’s partly to do with that first fleeting instance of being disappointed that something which felt special to me – a particular style of a vintage top, shirt, or tea dress – has then become ubiquitous when one brand or another decided to make it their ‘look’ of the season, before discarding again. Suddenly certain sartorial decisions fit a trend, rather than looking like they were actively selected. But maybe my attitude should be ‘the more, the merrier’, rather than a whole lot of muttering and wittering here. And even in writing this, I'm aware of all the shades and nuances and alternative arguments I haven't even touched on... More consideration needed. 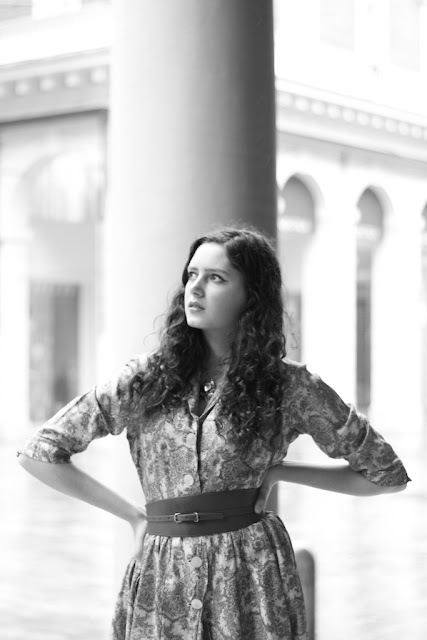 These photos were taken by the lovely Monica several months back when we were in Bologna. I'm wearing a bona-fide fifties dress (and eighties belt), but accompanied by modern ASOS shoes. Believe it or not, I was doing a bit of similar soul searching..walking home from the hospital, encountaring hundreds of tourists, noticing they all seem to be dressed the same, wearing the same high street shoes (zara and such), I wondered does my fascination with vintage has more to do with my selfish desire not to wear what everyone else is wearing than with ethic and eco philosophy that is often associated with vintage clothes...perhaps it is not so simple, perhaps I just love vintage for a variety of reasons....I do get what you mean...often when something is too trendy, I start to avoid it...perhaps there is nothing wrong in wanting to feel special in our clothes? Perhaps there is no wrong or right way to do it or rather there are many? You do look divine in that dress...love the shoes and belt as well...fabulous photos! 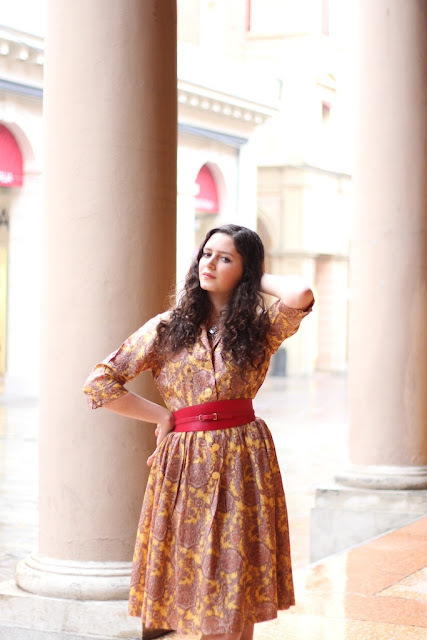 Love the print of that dress, and it looks great paired with the belt! And I totally see what you mean, if you're going to go vintage, go vintage, not fake vintage. Although, sometimes I'm guilty of going the new-vintage route, ha ha, but not on purpose. Like with Modcloth, I don't get how popular it is, its low quality imitations of what used to be made really well. I've found that better labels have better quality, even if they make repros of vintage, which is a step up from cheap, quick fashion store repros. I don't mind much when vintage is reproduced because it keeps a lot of people OUT OF MY THRIFT SHOP! More for me. Hurrah! But I've encountered high street women in the thrift shop and they've said to me, yeah, it's trendy to shop here. I shudder and step away. I love your outfit, especially those shoes, and the location. it's so frustrating when something you think is special and unique (personal style, music, art) becomes appropriated, commoditized, and inevitably bastardized. It strips all the soul from it and makes it into just another thing, another passing fad. Just remember that for the High Street crowd, it's just that and in a few months it'll be something new cluttering up the thrift store racks with cheaply made items. As they say, fashions fade, style is eternal. Vintage style clothing is as pointless to me as Mock Tudor houses, go original or go modern, don't accept some watered down substitute. I always love your posts, Rosalind; always such a pleasure to read. I really love your writing style; it demonstrates a depth of thought that I rarely see on other blogs. And the fact that you put your thoughts across so eloquently demonstrates how much deliberation goes into your thinking. Totally agree with your point about vintage garments. I think the thing that really rankles me is that High Street brands don't look at previous eras and think, what can I learn from the craftsmanship of years gone by? It's more a case of finding a trend that's starting to bubble under the surface, quickly looking at some old designs for inspiration and then get something out there as quickly as possible, as cheaply as possible and sell as many pieces as they can. That's obviously a very different game to the one that was being played when all of the gorgeous garments of yesteryear were created. It's not like Boohoo dresses will be seen as a source of inspiration for generations to come! I get it, I think. You're treasure-hunting, and there's nothing really to treasure in a style you can be pretty sure a thousand other girls are wearing. Plus, as you said, there's a difference in quality between the old and new stuff. And, the clincher, it's annoying to see these styles going mainstream. They're inevitably then going to go out of style, and where does that leave those of us who love old things? I mean, who cares if they're considered "out" at some point. I don't mean that. It's annoying to see something you love being used and tossed aside perhaps? Hmm, you're right. Hard to put your finger on it.